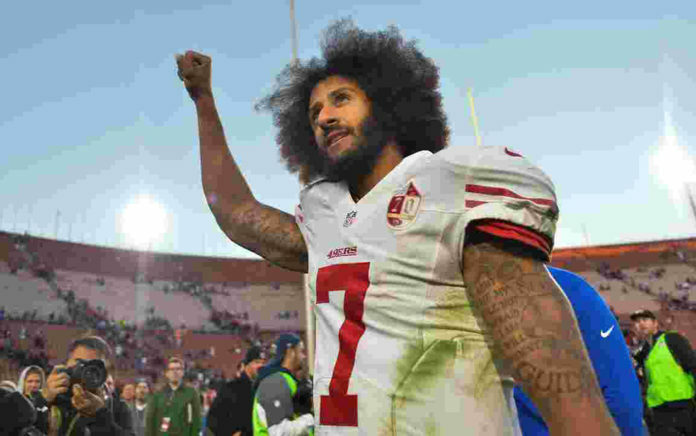 ESPN?s Jemele Hill: "It?s disheartening that the NFL Doesn?t Support Colin Kaepernick"
ESPN journalist Jemele Hill is blunt about one-time Super Bowl quarterback Colin Kaepernick?s dismal career prospects. ?He?s never going to play in the NFL again,? Hill told the Daily News ahead of her upcoming appearance at Ozy Fest in Central Park July 22. ?It?s disappointing, it?s disheartening and if you?re the NFL, you should feel very embarrassed by that.? That the NFL has seemingly decided to make an example of Kaepernick to dissuade other players from activism strikes Hill, 42, as ?startling,? especially considering the league?s spotty track record of disciplining ?criminals.? Kaepernick is currently a free agent, having not been signed by any of the 32 NFL teams after facing criticism for kneeling during the national anthem to protest police brutality and violence against people of color. The former San Francisco 49ers starter filed a grievance against the league and its owners last year, accusing them of colluding to not hire him. ?It wasn?t some crime (Kaepernick) did to somebody, it wasn?t hurting another person,? Hill said. ?It was using his right as an American citizen to call out some of the ills and atrocities in this country.? Regardless, she noted that Kaepernick is ?already in the history books.? ?He?s got an exhibit in the Smithsonian,? Hill said. ?He?s going to have streets and schools named after him.? Hill believes there will eventually be a ?softening? in a few decades, and that people will look back on Kaepernick?s refusal to stand for the national anthem the same way history remembers Muhammad Ali?s refusal to serve in Vietnam. ?After seeing what happened in Vietnam and how Ali?s career and activism further blossomed, people now say, ?Oh, he made the right decision. That was great!? ? Hill said. ?People want to wait until they?re proven right to actually say something is a good idea.? Hill has rarely held back from speaking her mind, which has propelled her into the national spotlight and elevated her as both a lightning rod for controversy and as a pioneering black, female journalist in an industry dominated by white men. It?s one of the reasons she?s been invited to speak alongside newsmakers like Hillary Rodham Clinton, Laverne Cox, Chelsea Handler and Martha Stewart at Ozy Fest, a two-day festival July 21-22 featuring panels, talks and live performances in Central Park?s Rumsey Playfield. Hill said she?s still getting used to random people on the internet ? and occasionally the White House, which infamously called for her to be fired last year for referring to President Trump as a ?white supremacist? ? telling her to ?stick to sports.? ?But if 45 seconds on Colin Kaepernick is going to ruin your day, then you need to get a little tougher,? Hill said. Despite the desire that many of Hill?s detractors have to divorce sports from current affairs, ?Sports is not a shield from the real world,? Hill argued. She pointed to gender violence in sports that?s been under-reported, as well as former USA Gymnastics national team doctor Larry Nassar?s sexual assault against members of the team, including minors, as examples of the ?real-world problems? that cross over into sports journalism. ?There?s no corner in America we can really go and not be bothered unless you?re watching cartoons all day, but that?s not real life,? Hill said. ?People act like this is some kind of new phenomenon where we?re going through a phase of talking about sports and politics, or sports and social issues, when that?s literally been the case with sports always.? Confronting uncomfortable issues ? including the policies of the Trump administration ? is ?part of the job? not just for journalists, but all citizens. Hill brought up that a majority of Americans supported internment camps for Japanese-Americans during World War II, and that the LA Times penned an editorial in favor of the camps 76 years ago. ?It goes to show that we?ve been repeatedly put up to this test and we?ve failed it,? Hill said. This tendency for history to repeat itself is the main reason Hill winces when she sees social media posts arguing that America ?is better than this.? ?As a journalist who?s responsible for putting these things into context, it?s fascinating and compelling to see that mentality over and over again,? Hill said. ?Every time we say we?re going to be better, we?re not better. ?